After Laurance A. See passed away, the remaining family members sought a buyer for their beloved company. Along came Berkshire Hathaway, run by Warren Buffett and Charles Munger. Warren and Charles greatly admired See's and were impressed by the brand's loyal customer base—not to mention the candy! Berkshire Hathaway purchased See's Candies in 1972. Born in Omaha, Nebraska in 1930, Warren Buffett has been dubbed the most successful investor of the 20th century. From a young age, Buffett showed a keen interest in business and investing. His first ventures included selling gum, Coca-Cola and magazines door-to-door. He is now known as one of the world's wealthiest people. 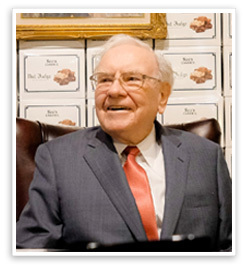 Warren Buffett's love for See's Candies is no secret. 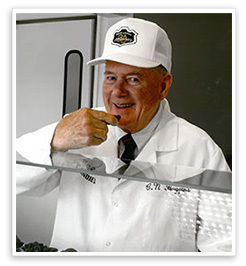 He first tasted our candy in 1971 and has since called See's a "dream business." Happily for him, it's also one that keeps him supplied with Peanut Brittle and Chocolate Walnut Fudge! 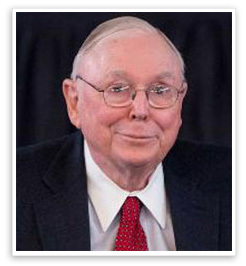 Warren Buffett's investment partner and Vice Chairman of Berkshire Hathaway, Charles "Charlie" Munger says that See's taught him the power of a good brand—seeing the strong loyalty of our customers was a surprise, providing a vital lesson for Charlie and Warren in their early investment days. Also from Omaha, Nebraska, Charlie was born in 1924 and studied mathematics at the University of Michigan. He served in the U.S. Army Air Corps as a meteorologist, and later graduated from Harvard Law School. He later moved to California with his family to work as a real estate attorney. When not busy with Berkshire, he even designs buildings! His work includes dorms at Stanford and University of Michigan, as well as his own home. In 1951, Chuck Huggins—a former World War II paratrooper—joined See's Candies. He was told by then-President Laurance See: "Learn See's version of how to run a quality candy business." He took that advice to heart, and his responsibilities grew over the next 20 years. Chuck's understanding of See's unique approach made him invaluable once Berkshire Hathaway acquired the company, and he was asked to lead See's Candies as President and CEO. As President, Chuck made sure to taste every new candy that was introduced, dubbing himself "Chief Taster." Chuck remained President and CEO of See's Candies for 34 years until his retirement in 2006. 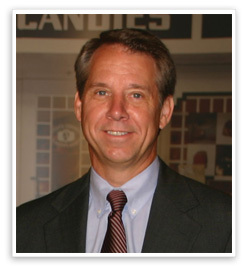 Warren Buffett and Charles Munger tapped Brad Kinstler to join See's Candies when Charles Huggins retired as CEO. Though new to the candy business, Brad Kinstler was no stranger to the Berkshire Hathaway family. After studying political science at the University of Nebraska and serving in the United States Air Force as a Russian Language Specialist in airborne reconnaissance, Brad held many positions within Berkshire Hathaway's family of brands, including President of Cypress Insurance Company and President and CEO of Fechheimer Brothers, Inc. Since joining See's Candies in 2006, Brad has devoted his efforts to upholding See's heritage of high quality candy, while also guiding the brand's growth and expansion—bringing deliciousness (and plenty of joy!) to new customers across the country. Truly, the key ingredient in See's success is the dedication of its thousands of employees, many of whom have served See's for decades. Each day, our employees produce, pack and ship our candy to customers around the world, while others help our customers in shops and online. 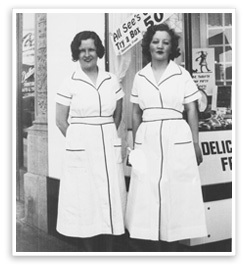 Others work in our offices, overseeing every aspect of the candy business. Thanks to these individuals, See's can accomplish its mission of quality without compromise and make life a little sweeter for all.